(February 16, 2005) In its first dramatic feature made specifically for the giant screen, Walt Disney Pictures is proud to present the continuation of a family favorite and a story that has enthralled generations of readers. The original writer and producer of THE BLACK STALLION have returned for this production, which will bring giant-screen audiences the wonder, excitement, and magic of Walter Farley’s equine hero as they have never seen it before. Bonus material unrated and subject to change. (February 16, 2005) A team of top filmmakers (including the screenwriter and producer of the original “Black Stallion” feature) join forces for this exciting new installment of a family favorite that has captured the imaginations of millions of readers and moviegoers. 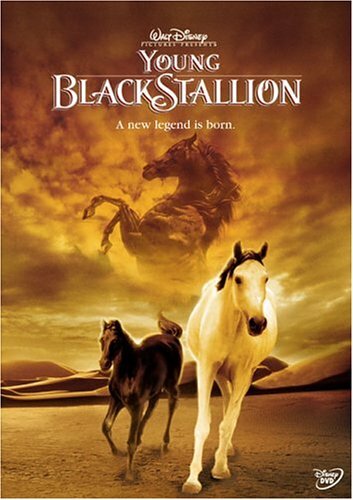 A prequel to the 1979 motion picture “The Black Stallion,” the film is Disney’s first dramatic adventure made expressly for the giant screen and follows in the Studio’s tradition of live-action adventure films for the whole family. Set in Northern Africa at the conclusion of World War II, this extraordinary film follows the adventures of a young girl named Neera, who becomes separated from her family and finds herself alone in the desert. When a wild stallion (whom Neera names Shetan) comes to her aid, the two form a special bond and the horse helps Neera to return home to her grandfather. As their friendship and trust grows, the girl devises a daring plan to race the wild Shetan (whose name means “the devil”) in the annual horse race and help restore her grandfather’s reputation. Staking everything on the race, Neera’s iron will and courage combined with Shetan’s untamed power and determination culminates in some of the most breathtaking and triumphant scenes ever visualized on the giant screen. Walt Disney Pictures presents “The Young Black Stallion,” starring Richard Romanus and Biana Tamimi. The film is directed by Simon Wincer and produced by Fred Roos and Frank Marshall. Executive Producers are Kathleen Kennedy and Jeanne Rosenberg. The screen story and screenplay is by Jeanne Rosenberg, based on the novel by Walter Farley and Steven Farley.The film is presented in IMAX® Theatres nationwide. Buena Vista Pictures distributes. “After ‘Olympic Glory,’ I know that you could find an emotional story that connects with the audience in the same way a 35mm movie can and combine it with the incredible vistas, sound, and color of large format, you could create an exciting, new moviegoing experience,” says veteran producer Frank Marshall. “Fred and Jeannie came up with just the right story that would show the beginning of the Black Stallion, which builds on the adventures we already know,” adds Marshall. Horse riding is second nature to Biana Tamimi who took to the saddle at age four and a half. In fact, Biana got the part when her friend, who saw the casting call on the internet, made a video of Biana’s riding lesson and sent it to the producers. 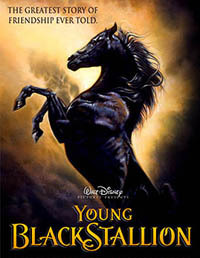 A continuation of what is still one of the most popular stories among young readers,”The Young Black Stallion” follows on the heels of the family classics,”The Black Stallion” (1979) and “The Black Stallion Returns” (1983). Adding to the experience this time around is the fact that the story will be told on the giant IMAX screen for the first time. Shooting on large format did, however, require a certain amount of adaptation on the part of the filmmakers. In excess of 40 Arabian horses and 10 camels were used in the film. Each horse featured was hand picked by renowned Australian Horse Trainer, Heath Harris. “The horses came from a stud in South Africa owned by Fanie and Jack Maritz. They are horses of amazing quality. Jack is an international show judge who goes all over the world judging Arabian horses. “Arabians are Moorish horses, magnificent creatures and a very old breed their blood lines go back about 2000 years,” says Harris. “In the Middle East they are highly regarded and, in some cultures, enjoy a status higher than that of the owner’s wife or children. They have a very noble bearing and an extraordinary look — big head, big eyes and flared nostrils, a dream horse.” However, working with them was an enormous challenge for Harris and his team because the Arabians they used were totally unfamiliar with the kind of work expected of them. “They are difficult to train because they’re ‘hot’ horses but once you have them trained they are remarkable, especially for film work,” concludes Harris. Harris has the utmost respect for the horses that he works with and regards them as being on par with actors. “Every horse has its own character and I work with that. These horses are essentially actors and they deserve the same rehearsal time as the actors. Particularly on this film where the horse is the star,” says Harris. For each featured horse used in the film there were two standby horses or understudies as it were. Each understudy had to match the featured horse exactly and in many cases the horses needed to be dyed. “Some of the horses enjoyed far more time at the hairdresser than any of the human cast members,” muses Krissy Harris. Harris was also very careful in his choice of mount for Tamimi. “I chose a horse with an even temperament and one that Biana was comfortable with. You cannot put a child on a horse that is going to scare them or destroy their confidence,” says Harris. His choice of Nyala was an instant hit with Tamimi. “He was a very special horse and some of my best moments were galloping out on him,” enthuses Tamimi. While there is a strong bond that exists between Neera and Shetan in the story, he is wild and the true test of her mettle comes when she is finally able to mount the wild horse, this posed no problem for the young actress. “I have worked with horses like that before, horses that are skittish and spooky, but I think they are all just really nice and have a good temperament,” says Tamimi. Both the horses and cast worked in extreme conditions throughout the shooting of “The Young Black Stallion” and while the cast were easily able to find respite from the heat and discomfort, every effort was made to make conditions pleasant for the horses as well. Playing “mother” to the horses was assistant horse trainer Krissy Harris. Two members of the Animal Anti-Cruelty League were on set at all times to ensure the well-being of the horses and other animals used during the making of the film. “We pride ourselves on the fact that no animal was injured or placed under undue stress during the making of this film,” comments Harris. Given the tight shooting schedule, the transformation of the casbah had to be completed in little more than two days. “In restoring the building for the second phase of shooting, we used brighter colors on the walls and rich carpets to subliminally show the fresh energy that Neera’s return had brought to Ishak’s life,” says set decorator Emilia Weavind. While the casbah was the biggest building on “The Young Black Stallion,” it was the Bedouin tent town that tested Weavind and her team to the limit. “The tent town is the setting for both the start and the end of the race, and because it was to be shot from a number of different angles, the dressing had to be particularly detailed,” says Weavind. “Bedouin tent towns are usually busy trading posts featuring little stalls selling everything from salt and spices to fresh produce. To create a bustling market atmosphere, we brought in about sixteen tons of dressing.” No detail was overlooked and when shooting commenced at the tent town, it looked for all intents and purposes like a real Moroccan market. “Casting Neera was becoming a worry because she had to be a rider and we had to do very specific things with her, the clock was ticking and we hadn’t found her,” recalls Simon Wincer. Then the unexpected happened and through a strange and fortuitous set of circumstances, the filmmakers discovered Biana Tamimi. “Suddenly she emerged and she had all these attributes,” says Wincer. Richard Romanus plays Neera’s grandfather Ben Ishak with celebrated Moroccan jockey, Ali Al Ameri cast as the powerful Mansoor and Gerard Rudolph as Sheik Rhamon. RICHARD ROMANUS (Ben Ishak) left law school to pursue a career as an actor. After studying at the Actor’s Studio in New York with Lee Strassberg, his first major role came as the character Michael in Martin Scorsese’s classic film “Mean Streets.” In the years that followed, Richard has performed in countless stage productions, films and television shows. In addition to his acting, Richard started to pursue both music and writing and is credited as the composer on several films and has written, most recently, with his wife Anthea Sylbert. Together they wrote and produced “Giving Up the Ghost” in 1998 and “If You Believe” in 1999, for which they were nominated for a Writers Guild of America Award. Born in Columbia, Ohio, BIANA TAMIMI (Neera) is a straight A, 6th Grade student at St. Andrews Episcopal School. She enjoys a Mexican/Palestinian heritage and is conversant in Spanish and has a firm understanding of Arabic. An accomplished rider who has been riding horses since the age of 5, Tamimi describes horses and horse riding as the love of her life. She has a horse named Buddy. She’s a hunter jumper and has taken part in numerous shows over the past few years. Recently she has cut back on the amount of shows she does in order to concentrate on hunter jumping. Her role models in the horse world include U.S. champion equestrians, David O’Connor and Karen O’Connor. Being an actress was always one of Biana’s secret wishes, however she never imagined that acting would be any more than a pipe dream. Landing the role of Neera, her very first acting role, was a dream come true and the chance to share the screen with a horse an even more special opportunity. She lists Julia Roberts and Tom Cruise as her favorite actors. Apart from a few brief appearances on TV, 11- year-old PATRICK ELYAS (Aden) has no previous acting experience. An American of Egyptian descent, he is a 6th Grade student in Los Angeles. Patrick is fluent in English, Arabic and French. He landed the role of Aden in “The Young Black Stallion” when a family friend suggested his name to casting assistant Marjorie Noble. His impressive audition immediately made him a favorite for the role. “The Young Black Stallion” marks his feature film debut. Acting in his first feature has given him a much greater appreciation for the filmmaking process. Away from the world of film, Patrick’s ambition is to be a businessman and perhaps also a politician. He foresees a diversified career in finance and petroleum. He enjoys the internet, watching television and playing basketball with friends. He lists Michael Jordan, Reese Witherspoon, Pat Rafter, Chris Rock and Sean Connery as some of his favorite greats. SIMON WINCER (director) has won equal success in the United States after ascending to the position of one of Australia’s most celebrated film and television directors. In the summer of 1993, Wincer’s “Free Willy” was a critical and commercial hit, which took in more than $200 million worldwide. For American television, Wincer directed the hugely successful epic miniseries “Lonesome Dove,” which ranks among the top dramatic programs ever screened in the U.S. “Lonesome Dove” was nominated for an incredible 18 Emmy Awards, winning seven, including Best Director for Wincer. In 1999,Wincer directed “P.T. Barnum” for A&E, starring Beau Bridges. The four-hour miniseries was nominated for Best Miniseries and Best Performance by an Actor at the 2000 Emmy Awards. Also in 2000, Wincer’s “Crossfire Trail,” a Louis L’Amour Western starring Tom Selleck, became the highest-rated movie ever screened on U.S. cable television. In January 2003, Wincer’s “Monte Walsh,” starring Selleck and Isabella Rossellini screened to another ratings record — the highest audience ever for a Friday night movie on cable and a combined three-night audience of 36 million. Wincer has been involved with some of the largest-grossing Australian films in history. As the executive producer of “The Man from Snowy River” and the director of “Phar Lap,” Wincer proved to be one of the few filmmakers in his country able to channel his expertise into producing and directing with equal success. Wincer is currently directing his second 15/70 film, entitled “NASCAR:The IMAX Experience 3D” for a Spring 2004 release in IMAX Theatres worldwide. Almost by accident, she fell into the world of dramatic feature films when she learned that Carroll Ballard would be directing “The Black Stallion.” Having re-read the book for a script analysis class at USC, she was certain this favourite childhood novel would make a wonderful movie. When she sent her analysis to Carroll Ballard and offered to help, she hardly expected a response. His phone call came as a delightful surprise. Enthusiastically she went on location where she partnered with Melissa Mathison to write the screenplay, often finishing a scene only moments before the cameras rolled. It was an exciting, if somewhat unconventional introduction to the world of narrative films. She also continued to write. Her first original screenplay “The Journey of Natty Gann,” the story of a young girl’s cross-country odyssey set during the Great Depression, was produced by Disney in the mid 1980’s. The wolfdog from Natty Gann became the inspiration for Jeanne’s next project, an adaptation of Jack London’s “White Fang”. Writing quickly grew into a full time occupation. Of her many projects, several screenplays have been produced including “Running Free,” “Rip Girls” and “Heidi.” In addition, Jeanne has been involved in an emerging, innovative kind of filmmaking — dramatic, large format movies. These include the films “T-Rex: Back to the Cretaceous” and “China:The Great Panda Adventure” as well as “The Young Black Stallion” a project she initiated with Fred Roos who was a producer on the original “Black Stallion” movie. They hope to once again create magic, this time on the big, big screen. Besides her writing and producing, Jeanne plans to be directing in the near future. Meanwhile she manages to find time to ride and show reining horses. She lives with her husband Max Trumpower (a builder and actor of enormous talent), her daughter Erica and son Alex on their horse ranch nestled in the rugged hills near the outskirts of Los Angeles. WALTER FARLEY’s (based on the novel by) love of horses began when he was a small boy living in Syracuse, New York. Walter never owned a horse, but gained firsthand experience of horses through his uncle, a professional horseman. Walter began writing his first book, The Black Stallion, while he was a student at Brooklyn’s Erasmus Hall High School and Mercersburg Academy in Pennsylvania, and finished it while he was an undergraduate at Columbia University. It was published by Random House when he was 26. The appearance of The Black Stallion in 1941 was hailed by enthusiastic boys and girls all over the country and an avalanche of mail urged Farley to write more about Alec Ramsey and the Black. However, World War II intervened and it was only after the War that Farley resumed the adventures of Alec and the Black with The Black Stallion Returns. This was followed by Son of the Black Stallion. Walter Farley’s books have been published in more than 20 countries, including Austria, Czechoslovakia, Denmark, England, Israel, Finland, France, Germany, Holland, Iceland, India, Indonesia, Italy, Japan, Malaya, Norway, Russia, Saudi Arabia, Sweden and Switzerland. They have sold millions of copies in all their editions. Walter Farley died in October 1989, shortly before the publication of the twenty-first book in the Black Stallion series, The Young Black Stallion, written with his son, Steven.The book was dedicated to his first grandchild, Miranda. STEVEN FARLEY (based on the novel by) has picked up the torch passed by his father,Walter Farley. When the elder Farley became too ill to continue work on what would be his final novel, The Young Black Stallion, Steven completed the work. He has since gone on to write several books in the Young Black Stallion series, a new series of novels about a girl and a very special black colt. The books are set in Florida horse country, not far from Farley’s childhood home. He is also the author of The Black Stallion’s Shadow and The Black Stallion’s Steeplechaser, two new books in the Black Stallion series. Roos began formally producing in the 1960’s with director Monte Hellman’s film, “Backdoor to Hell.” While shooting the film on location in the Phillipines, Roos and the film’s star, Jack Nicholson, conceived of the story for their next collaboration with Hellman, “Flight to Fury,” shot immediately after. Roos’s services as a casting director became increasingly sought after and he began casting features such as “The Godfather,” “American Graffiti” and “Five Easy Pieces,” “Petulia,” “Fat City,” and “Zabriske Point” which helped launch the careers of numerous legendary Hollywood actors. His 30 year collaboration with Francis Ford Coppola started when Coppola asked him to cast “The Godfather” in 1971. Soon, Roos began producing for Coppola, starting with 1974’s “The Conversation” which won the Palm D’Or at Cannes and was nominated for three 1975 Academy Awards®, including Best Picture. “The Godfather, Part II” followed and was nominated for a total of eleven Academy Awards® and won six including Best Picture. Their next collaboration was the groundbreaking “Apocalypse Now” which also won the Palm D’Or as well as the Golden Globe for Best Drama. It was nominated for eight Academy Awards® including Best Picture and won two. This year, in addition to “The Young Black Stallion,” Roos also Executive Produced Sofia Coppola’s critically acclaimed second film, “Lost in Translation,” starring Bill Murray. FRANK MARSHALL (producer) is one of the motion picture industry’s most respected filmmakers. With an astonishing number of films to his credit as a visionary producer who irrevocably transformed American film, he has also excelled as a director and, transcending his chosen industry, found the time to devote his talents to numerous endeavors in public service and sports. As a producer, Marshall has over fifty films under his belt. He has already made several trips to the Academy Awards®, having been nominated in the Best Picture category in 1982 for “Raiders of the Lost Ark” and again in the same category in 1985 for “The Color Purple” with co-producers Steven Spielberg, Quincy Jones and his wife, Kathleen Kennedy. One of his most recent projects, M. Night Shyamalan’s 1999 box office smash “The Sixth Sense,” was nominated for six Academy Awards®, including Best Picture. Marshall was line producer on Martin Scorsese’s “The Last Waltz,” the heralded musical documentary on The Band. He then began a two-film association with director Walter Hill, first as associate producer on “The Driver,” then as executive producer of “The Warriors,” both of which have also attained a certain cult status among cineastes. Marshall was also line producer of Orson Welles’s legendary unfinished film, “The Other Side of the Wind,” to which he periodically returned from 1971 through 1976. Marshall left Amblin in the fall of 1991 to pursue his directing career. Together with Kathleen Kennedy, he formed The Kennedy/Marshall Company, under which “Alive” was the company’s first release. In 1995, he directed “Congo” and produced the highly acclaimed film “The Indian in the Cupboard” with Kathleen Kennedy and Jane Startz. In 1997, he directed his episode of “From the Earth to the Moon,” which centered around the Apollo 11 moon landing. The Kennedy/Marshall Company’s productions include a remarkably diverse group of films, including “Snow Falling on Cedars,” directed by Scott Hicks; “A Map of the World,” starring Sigourney Weaver and Julianne Moore; “The Sixth Sense,” starring Bruce Willis and Haley Joel Osment; “Olympic Glory,” the first official large format film of the Olympic Games; “The Bourne Identity,” starring Matt Damon; M. Night Shyamalan’s “Signs,” and this year’s box office success, “Seabiscuit,” the dramatic true story based on Laura Hillenbrand’s bestselling book and directed by Gary Ross. Marshall is currently producing “The Bourne Supremacy,” with Paul Greengrass to direct and Matt Damon returning as Jason Bourne. Photography will commence this fall in Berlin and Moscow. While at UCLA, Marshall ran cross-country and track and was a three-year Varsity letterman in soccer. He continues to find time for his love of music and sports and participates in distance races worldwide. Combining his passions for music and running, he, along with America’s premiere miler Steve Scott, founded the Rock ‘N’ Roll Marathon, which debuted in 1998 in San Diego as the largest first time marathon in history. Marshall is a Vice President of the United States Olympic Committee, a board member of The Los Angeles Sports Council, Co-Chairman of The L.A. Mentoring Partnership and a member of the UCLA Foundation Board of Governors. He is a recipient of the acclaimed American Academy of Achievement Award, the UCLA Alumni Professional Achievement Award and the California Mentor Initiative’s Leadership Award. KATHLEEN KENNEDY’s (executive producer) record of achievement has made her one of the most successful executives in the film industry today. Among her credits are three of the highest grossing films in motion picture history — “E.T. the Extra-Terrestrial,” “Jurassic Park,” and “The Sixth Sense,” which she produced with Steven Spielberg, Gerald R. Molen and Frank Marshall, respectively. Kennedy served as co-president of the Producers Guild of America last year, and was re-elected as the PGA’S sole president this year. She currently heads The Kennedy/Marshall Company, which she founded alongside director/producer Frank Marshall in 1992. Kennedy/Marshall’s productions range from critically acclaimed blockbusters such as “Signs” and “The Sixth Sense,” which was nominated for six Academy Awards® including Best Picture, to intimate films such as Scott Hicks’s “Snow Falling on Cedars” and “A Map of the World,” starring Sigourney Weaver and Julianne Moore. Kennedy/Marshall recently produced the film adaptation of the non-fiction bestseller, “Seabiscuit,” written and directed by Gary Ross and starring Tobey Maguire, Jeff Bridges and Chris Cooper. Kennedy has sustained a long-standing creative association with Steven Spielberg through dozens of projects, serving as producer or executive producer on such landmark films as “Schindler’s List,” “Empire of the Sun” and the recent “A.I. : Artificial Intelligence,” as well as “E.T. the Extra-Terrestrial” and “Jurassic Park.” Their collaboration began when Kennedy served as writer John Milius’s assistant on Spielberg’s “1941”. She became Spielberg’s assistant on “Raiders of the Lost Ark,” his associate producer on “Poltergeist,” and then producer of “E.T.” While “E.T.” was becoming an international phenomenon, Spielberg, Kennedy and Marshall were already in production on “Indiana Jones and the Temple of Doom,” which she and Marshall produced with George Lucas. Kennedy co-founded Amblin Entertainment with Spielberg and Marshall in 1982. Amblin’s productions included “The Color Purple,” which earned eleven Academy Award¨ nominations in 1985, including Best Picture. Later that year, Kennedy, Spielberg and Marshall produced 1985’s highest grossing film, “Back to the Future”, which they followed with two highly successful sequels, “Back to the Future, Part II” and “Back to the Future, Part III.” Their many projects also included the Amblin Entertainment/Malpaso Production “The Bridges of Madison County,” directed by Clint Eastwood, Jan DeBont’s action thriller “Twister” and the Spielberg-directed “The Lost World.” Amblin’s first animated feature was the endearing “An American Tail” in 1986. Next came the adventurous “Who Framed Roger Rabbit,” which boldly blended live-action and animated characters and was the top-grossing film of 1988. Other animated hits included the sequel to “An American Tail” as well as “The Land Before Time” and its sequel. Kennedy produced Frank Marshall’s 1990 directorial debut “Arachnophobia,” with Richard Vane and re-teamed with Robert Watts to produce Marshall’s second film “Alive” in 1993. In the summer of 1995, The Kennedy/Marshall Company released the Marshall-directed “Congo,” which Kennedy produced with Sam Mercer. Raised in the small Northern California towns of Weaverville and Redding,Kennedy graduated from San Diego State University with a degree in telecommunications and film. While still a student, she began working at a local San Diego television station. Following jobs as a camera operator, video editor, floor director and news production coordinator, Kennedy produced the station’s talk show “You’re On.” She then relocated to Los Angeles and worked with writerdirector John Milius prior to beginning her association with Spielberg. He has specialized in the production and photography for large format films including “Grand Canyon: The Hidden Secrets,” “Mysteries of Egypt,” “Yellowstone,” and “To Be An Astronaut.” He directed and photographed the large format film “The Great American West” and was one of five large format cinematographers selected to film the Nagano Winter Games for the production “Olympic Glory”. He was director of photography on the Sony Pictures Classics/Cirque du Soleil IMAX 3D film “Journey of Man” winning the 1999 GSTA Award for Best Large Format Cinematography. In May 2001 Reed Smoot was presented with the KODAK® Vision Award for contributions to large format filmmaking. He is a charter member of the Large Format Cinema Association and is an active member of the American Society of Cinematographers and the Academy of Motion Picture Arts and Sciences. Peters has been the production designer on many more films, including Alan Rudolph’s “Made in Heaven”; “The House on Turk Street,” directed by Bob Rafelson; and “American Pie” and “Down to Earth,” both from the directing team of Chris & Paul Weitz. JO KATSARAS (costume designer) was born in Cyprus, but relocated to Johannesburg when she was 5 years old. She was a naturally talented child who started sewing at the age of 8 and displayed a natural flair for cutting patterns. Often she would simply get friends to lie down on a piece of fabric and cut around them. After completing her education at the Johannesburg School of Art, Drama, Music and Ballet she seriously considered a career in architecture, but decided to travel the world before furthering her studies. However, her father’s insistence that she get a qualification that she could fall back on changed the course of her studies. Taking her natural talent to the next level, Katsaras enrolled at fashion school where, given her ability to draw, sew and cut patterns, she was allowed to enroll for the final year of a three-year course, thus completing her diploma in one year. Returning from her travels, Katsaras entered the world of fashion working as a Senior Designer at a large clothing manufacturer. However, she soon discovered that her real area of interest lay in designing individual wardrobes — unique clothing that defined the wearer. Film was therefore a natural progression for Katsaras who found ultimate expression for her creativity through this medium. Her rise through the ranks in the film industry was no less dramatic than that of completing her diploma, and within eighteen months of entering the industry as an assistant, Katsaras rose to the position of head of department. To design for feature films and television was to enter a world of fantasy, where Katsaras could indulge her every fantasy, creating beautiful garments for unique characters. She thrives on the challenge of condensing a wealth of information about a character into a single garment and is thrilled by the fact that her designs are preserved in perpetuity on celluloid. Since designing her first feature, “There’s a Zulu on My Stoep,” Jo Katsaras has designed for a number of commercials as well as television series and feature films. Her feature credits include: Jean Jacques Annaud’s “Running Wild” for Sony, Carl Schenkel’s “Tarzan and the Lost City,” starring Casper van Dien and Jane March, and the 2001 South African box office hit “Mr Bones,” starring Leon Schuster,David Ramsey and Faizon Love. HEATH HARRIS (head horse trainer) has horse mastered, trained, stunt co-ordinated, and second unit directed over 40 feature films and approximately 120 commercials and television series, including New Zealand’s “Black Stallion” television series. His diverse knowledge and experience has led to such diverse positions as creative consultant to Marlboro, trainer of racing camels in the Emirate of Abu Dhabi, and, later, Director of Desert Veterinary Services for the Abu Dhabi Government. A native Australian, he returned to his home country to team with his wife, Krissy, to create a competitive show jumping team as well as two live shows: “Heath Harris’s Movie Magic,” in which he explains to the audience how horses are trained for the movie business, and “Girls Girls Girls,” a troupe of 7 trick riders and horses who perform daredevil stunts, whip cracking, and song and dance routines to audiences all over Australia. BEVERLEY HOUSE (hair & make-up) completed her schooling in Johannesburg, South Africa, and enrolled at the Rhona Greaves Face to Face Make-Up School to study Beauty Make-Up,Theatrical Make-Up and Feature & Television Make-Up as well as Special Effects. Having completed this course with distinction, House completed an International Diploma in Make-Up Artistry. Her first break came when she was appointed Assistant Make-Up and Hairstylist on the 1988 feature “Purgatory”. The opportunity to work alongside some of the leading make-up artists and hairdressers working in film and television industry provided her with a thorough understanding of the specific requirements of both film and television. Having worked in the film industry for some years, House branched into television and worked on a number of teleseries including the phenomenally successful South African multi-lingual soap opera “Egoli: Place of Gold.” However, after a few years, she returned to working on feature films and commercials. ROLY JANSEN (stunts & special effects) is a founder member of Stunt S.A., a specialist stunt and SFX company based in Johannesburg, South Africa. He has a wealth of experience built up over the many years that he has worked in the film and commercials industry. His feature film credits include “The Piano Player” starring Christopher Lambert and Dennis Hopper; “Second Skin” starring Natasha Henstridge, Angus McFadyen and Peter Fonda; Jean Jacques Annaud’s “Running Wild”; “Tarzan and the Lost City” starring Casper van Dien and Jane March; the acclaimed South African struggle musical, “Sarafina!”; “The Spear” starring Elizabeth Hurley; and “Danger Zone” starring Billy Zane and Robert Downey Jr.
WILLIAM ROSS (music by) is a prolific, award-winning composer and arranger whose work has spanned feature films, the recording industry, and television. He has composed the scores to such films as “Tuck Everlasting,” “My Dog Skip,” the IMAX film “T-Rex: Back to the Cretaceous,” “A Smile Like Yours,” “The Evening Star,” “My Fellow Americans,” “Tin Cup,” “Black Sheep,” and “The Little Rascals.” His work for television includes the critically acclaimed miniseries, “Me and My Shadows: Life with Judy Garland” and the opening sequence for “The Wonderful World of Disney,” among others. Ross has arranged for a remarkable list of artists, including Barbra Streisand, Celine Dion, Jennifer Lopez, Whitney Houston, Kenny G, Michael Jackson, David Foster, Quincy Jones, and Babyface. He arranged Dion’s performance of “The Star Spangled Banner” for the 2002 Super Bowl and her performance of “God Bless America” on the nationally televised Concert for America. His arrangements have been featured in many films, including Celine Dion’s “My Heart Will Go On” (from “Titanic”), Gloria Estefan’s “Music of My Heart” (from “Music of the Heart”), and Jennifer Lopez’s “Alive” (from “Enough”). Academy Award® and Oscar® are registered trademarks of the Academy of Motion Picture Arts and Sciences.